This is the "player's handbook" for the game. 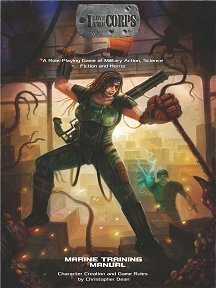 Publisher's blurb: "Character Creation and Game Rules for I Love the Corps, the role-playing game of Military Action, Science-Fiction and Horror. "Earth is a distant memory. The remains of humanity are disparate and feuding. The Colonial Dominion claims that all is well. The average citizen thinks that 'Rebels' are all there is to worry about. They don't know a thing. "And neither does your average grunt of the United Colonial Marine Corps. But they will learn soon enough. Shapeshifters could be masquerading as your Sarge. Psychotic Artificial Intelligences may be trying to 'improve' the galaxy by removing humanity. There are alien parasites that bite into your skin, crawl inside you and control your every move. That's just the beginning, marine! "If you ain't ready for that, you better find another Marine Corps!"